Progressions has been busy this past month! Our Intermediate Band recently had a double coming-out party, so to speak, and this past Saturday Progressions students got to watch renowned pianist Alexander Ghindin play a triple encore solo piano concert at Foothill College thanks to a partnership with the Steinway Society of the Bay Area. Saturday, February 28 18 Intermediate Band kids performed to a supportive crowd at the Mayor’s Annual Crime and Gang Prevention Summit at Mt. Pleasant High School. Before the performance, sixth grader Ayoko Aguirre gave a testimonial to the audience about the ways in which Progressions has changed his life. “It makes my school work much easier,” he said. “And now I am part of a supportive team – no one gets mad when I make a mistake. We just help each other figure it out.” San Jose Jazz is grateful to the Mayor’s Gang Prevention Task Force for the invitation to perform, and for providing transportation to Progressions students to travel to and from the event. 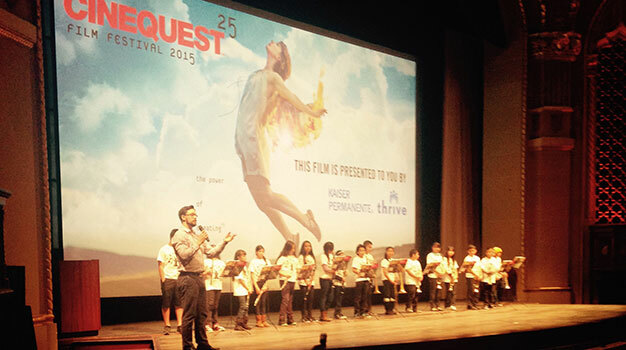 On Sunday, March 1 the Intermediate Band kids performed again, this time as an introduction to the Cinequest showing of Crescendo! The Power of Music, a movie about two El Sistema-inspired programs in New York City and Philadelphia that are using music to achieve social transformation among at-risk youth. Before the performance, Progressions families met at Cesar Chavez Park for pizza and cookies. Nearly 80 Progressions students and family members were in the audience at the California Theatre to support the Intermediate Band. Thanks to Kaiser Permanente and Cinequest for making this evening possible. After the performance, the children reflected on the experience. 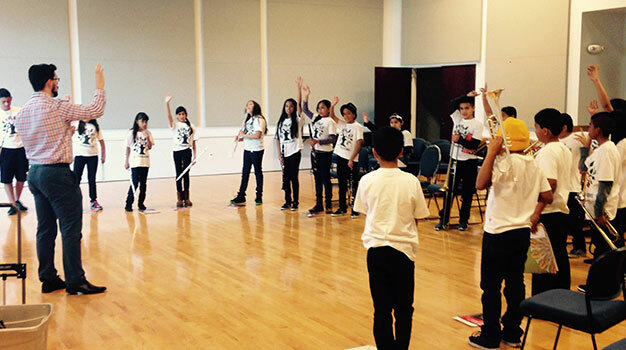 “Being a part of Progressions has made me feel more alive,” wrote one girl. “I have discovered a new part of myself that I previously did not know existed, “ shared another. “I will never forget this evening!” wrote several others. The kids did an incredible job in their first performances outside a school or camp setting, and they tell us they are motivated and ready for more! In addition to providing opportunities to participate in public performances, Progressions is committed to inviting our students to experience professional performing artists. Thanks to a partnership with the Steinway Society of the Bay Area, 35 students and family members from College Connection Academy, Jeanne R. Meadows Elementary School, Success Academy and Santee Elementary School watched a solo piano concert by Alexander Ghindin on Saturday, March 14. The students experienced the music of Tchaivkovsky, Medtner, Prokofiev, Mussorgsky, Rimsky Korsakov and more. After the concert, one girl told me her favorite piece was Dumka: Russian Rustic Scene, Op. 59 by Tchaikovsky. When I asked her why, she responded that it was because there is a wonderful story that goes along with it. She proceeded to tell me an intricate story about a battle in a meadow, what the wronged person had to do to avenge his attacker, and more. She demonstrated a stunning capacity to create her own visual interpretation of the sound. At the end of the concert, one of my most fidgety girls excitedly asked me when we would be invited back. College Connection Principal Amber Andrade and I are grateful to the Steinway Society of the Bay Area and Martha Reitman for making this evening possible for our students and their families.